Glaucoma is a disease of the optic nerve, which causes loss of peripheral vision initially, and can lead to tunnel vision and then blindness. In most types of glaucoma, the nerve damage occurs slowly and creates blind spots in peripheral vision, but as the disease progresses, these blind spots enlarge and grow together. It is common for a person not to notice they are afflicted until the later stages of the disease when the central vision becomes affected. At this point severe and irreversible vision loss has occurred. In a less common form of glaucoma, called acute angle-closure glaucoma, patients may experience sudden onset of a red, painful eye with blurred, steamy vision and seeing haloes or rainbows around lights. 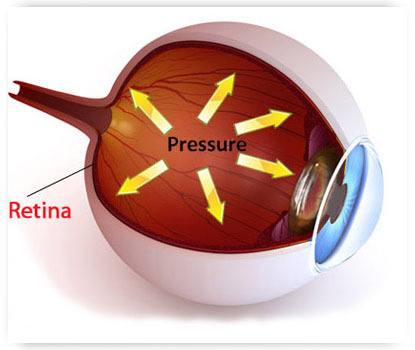 This is a Medical Emergency and requires immediate urgent treatment to lower the eye pressure and prevent blindness. Most cases of glaucoma, if detected early, can be successfully controlled, provided the patient is compliant with using their medication and returning for regular monitoring and follow-up care.